There were a number of firsts with the painting of Hillary Clinton's portrait. The first African American portrait artist Simmie Knox did a tandem of her and President's Clinton's official oil portraits. 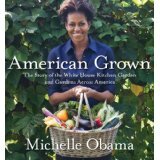 She is wearing a pantsuit with her hand touching her best selling book with an example of historic White House China on the table. The painting hangs on the Ground floor in the Hall. Portraits courtesy of the White House Collection. Teacher for the Deaf & crochet expert Grace Anna Goodhue Coolidge 1923 - 1929 as First Lady Teetotaler Lucy Ware Webb Hayes 1877 - 1881 as First Lady Daughter-in-law Angelica Singleton Van Buren acted as hostess/First Lady 1839-1841 as Hannah Van Buren had passed away. Permanently displayed in the Red Room. Louisa Catherine Johnson Adams (1825-1829) is the daughter-in-law of Abigail Adams is the first lady who advocated for females and their rights. Wearing French empire and showing shapely cleavage, the Dolley Payne Todd Madison portrait (1804) in oil by her friend Gilbert Stuart is so well known it graces alongside presidential portraits. She was the official hostess for Thomas Jefferson when the portrait appeared and later she became first lady With 44 presidents and 46 first ladies in total, (some presidents were widowers and remarried or bachelors or married for the first time while in office), the wall space in the 55,000 square foot Executive Mansion has prime space and lesser space. The current president and first lady select who goes where. 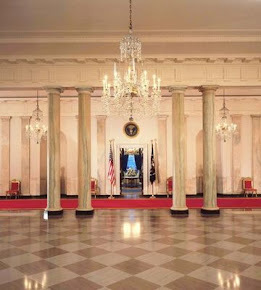 One prime piece of real estate is just beneath and around the Grand Staircase just off the foyer or anything on the state floor and mostly, it is the presidents in the corridors with special first ladies or hostesses of presidents inside the colored salons off the Cross Hall. Tourists see the Vermeil Room on the ground floor where its incandescent light makes Jackie Kennedy's acclaimed portrait seems as if its always hung there in its rightful prominent place. Martha Dandridge Custis Washington has the most prominent space along the same wall and same height of her husbands Gilbert Stuart painting of her husband George in the White House's largest formal space, the East Room. Elizabeth Kortright Monroe's (tenure 1817 -1825 though her daughter Eliza stepped in most of the time as hostess) oil portrait by John Vanderlyn retains a prominent place near the South Portico just before the entrance to the Green Room. Her ermine shawl is perfect for the French Empire design of the Blue Room she and her husband worked so hard to furnish. The artists themselves are varied with some interesting stoeirs. Anders Zorn painted the youngest first Lady ever, Frances Folsom Cleveland. Howard Chandler Christy painted Grace Coolige with her collie, Rob Roy, beside her and the South Portico of the White House over her shoulder. Boldly sporting a nineteenth century pompadour, Henry Inman painted Angelica Van Buren who was related to Dolley Madison by marriage. Inmans work populates the vast White House Art Collection with many paintings of The First People. Modern twists occurred with Eleanor Roosevelt (1933 - 1945) the hands never still and Mamie Eisenhower (1953-1961) in her inaugural ball gown. Florence King Harding has a memorable coif immortalized in oils by Philip Alexius deLaslode lombos in 1921. The chair pose is almost as popular as the ones with the White House as a backdrop. Completed in 1967, Elizabeth (Bess) Wallace Tru man seems to be the modern start for the seated pose. Above, wearing the famed triple strand is Barbara Pierce Bush (1989 - 1993) from 1992 painted in oils by Herbert E. Abrams. Elizabeth (Betty) Bloomer Ford painted by Felix De Cossio. It took awhile post presidency for the portrait of Rosalynn Smith Carter (1977-1981). In 1984, the softly hued oil portrait was completed by George Agusta. Rosalynn Carter has nothing on Martha Washington (1788-1796) whose official portrait came from Eliphalet F. Andrews who used a live model and dress from the nineteenth century when she was definitely a person of the eighteenth. The portrait was finally done a hundred years after the founding of America in 1878. A new twist with oval portraits and using two Ediths. Edith Carrow Roosevelt (1901 - 1909) used a different frame, the south White House gardens while sitting on a bench. Edith Bolling Galt Wilson (1913 -1821) was the second first lady of the Wilson Administration who approved who and what the president saw during his illness and recovery. First lady oil paintings are fascinating with the variety of styles and choices for what they want to project for the American People in the centuries to come. These portraits are waves from the past that reflect on style, culture, and the individual - the American way! Note: An official photograph is also issued with the advent of technology. Mrs. Obama in oil ought to be as spectacular as the full official photo. Really nice entry, can I share it on my blog? Afterall, you have shown the Stuart portrait of Dolly! Thank you. We look forward to seeing it there and would like to hear what your readers think too Beth. Appreciate your picks. Eleanor wanted to day something with her portrait. Hillary wanted to be who she was a US Senator at the time. I love the artist that did Jackie's & Nancy's picture. Thank you so VERY much for your support. My hand is better now so I can type again without spelling errors.